You are currently browsing the tag archive for the ‘pastors’ tag. 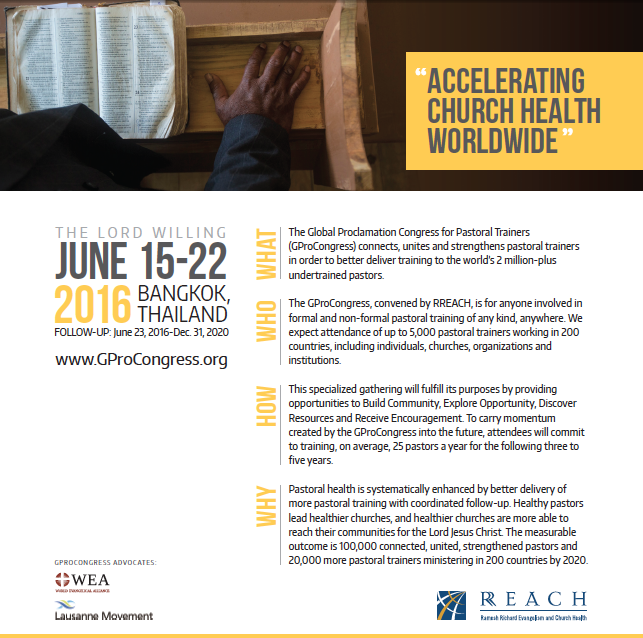 There is going to be an amazing gathering in Bangkok, Thailand in June 2016. Pastors and those who train pastors around the world will gather for a world wide congress focused on training pastors in countries that are underserved with quality pastoral training. Many of these are some of the poorer countries of the world. If you know someone who is burdened for some of these countries or a specific country and would love to see pastors better trained to lead churches, advocate for the lives of the oppressed and serve those who have very few options for living a fulfilling life, then take a look at this flyer and pass it on to those you know. Pastors who attend will undoubtedly make new colleagues from their own country and return home with a network of support and cheer. Others who are desirous of training pastors will find new avenues to apply their skills and trades. Come, send or encourage. This will be a catalytic event in the lives of God’s appointed shepherds around the world. Pastor Gregg Matte sensed a deep-seated burden from the Lord. He has been challenged by the Spirit to make prayer a reality in his personal daily practice for over the last year. In his intercession God impressed on his heart a rallying of the pastors of our city to gather and to pray. He sent out an invitation for pastors to meet for prayer in his office on a Thursday in November. The simple agenda was to prayer together for the city of Houston. Remember this gathering for pastors and ministry leaders was planned a month and a half in advance. The week of the pre-planned event, the city of Houston became world news. Houston’s mayor had sent out a subpoena to five local pastors. Each of these ministers were ordered to hand over all sermons that spoke on homosexuality or mentioned the mayor. The Christian community was shocked. But, they were not shocked into compliance or frightened into submission. Instead, the pastors rose up and stood together. 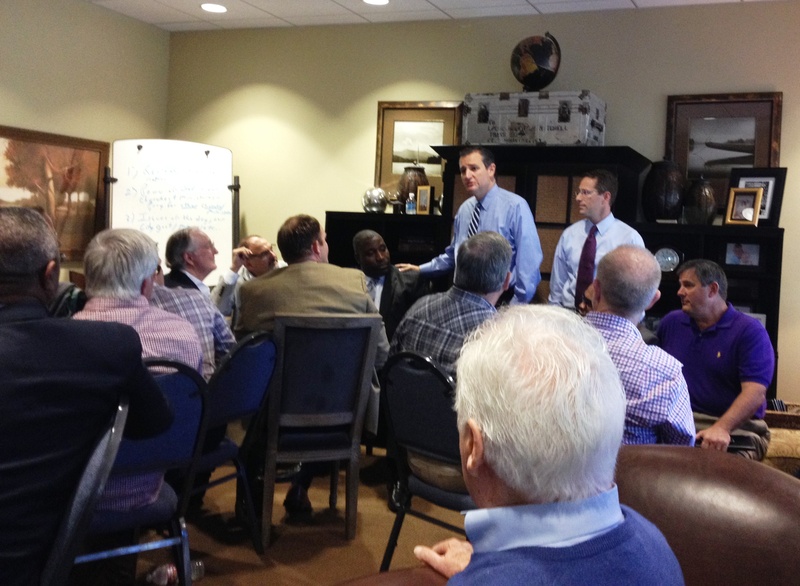 Senator Ted Cruze joined the pastors who gathered in Pastor Gregg Matte’s office. He never knew that this was part of God’s providential plan. But, the time was perfect. The media came to cover this galvanizing event, historic in American church history. Pastors normally humbly compliant and supportive of our God-ordained governmental officials, drew a line in front of their pulpits. No governmental intimidation or control over the message of God delivered in the name of His Son would be tolerated. 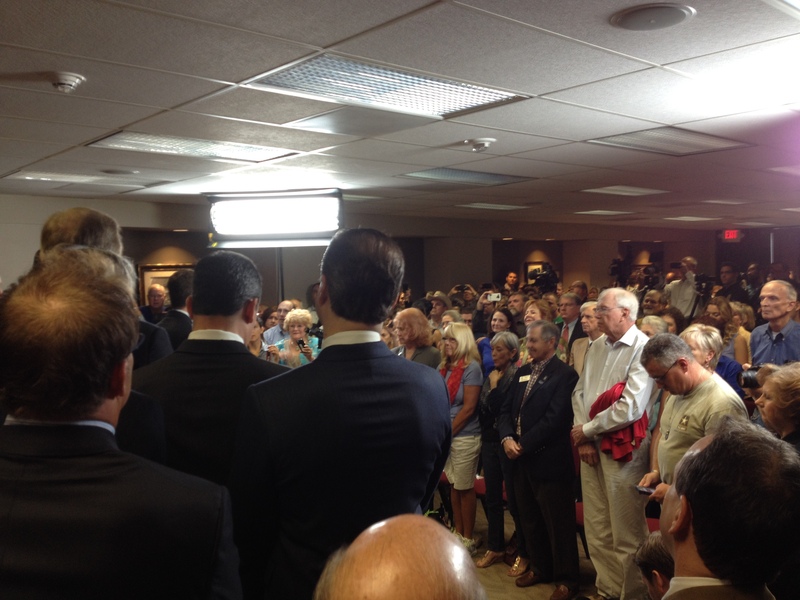 Over 50 pastors packed into Pastor Gregg’s office. He directed the prayer session to pray for our mayor, protect the church and move on the local government to rescind their directive of control over the pulpits of the city. We broke up into groups of 4-6 and prayed up a powerful time of intercession and supplication. After an hour of prayer we moved downstairs to stand in solidarity before the news cameras as Senator Cruze addressed the media. Clearly he spoke courageous words of freedom, liberty and religious autonomy. God’s servants had a right to speak the words of God without governmental oversight or control. God’s calling was the sole directive in the words spoken in American pulpits. Furthermore, it was a liberty written in our own Constitution. The scene of pastors from different denominations, various ethnic backgrounds and multi-generational was powerful. They stood together with the common bond of Christ among them. We have been putting off our vacation as long as we could. In my employment we must use our vacation by the end of the fiscal year. We may not carry over vacation time. My first year on the job has been very busy and the learning curve has been high. There has not been any time to take off for a break. Finally, by force of the calendar we are off from work for a few weeks. My bride and I laugh since we have been so busy that we have not had time to plan for our time off. The first few days has been just decompressing and planning our days away. Providentially, we noticed that the Southern Baptist Convention Pastor’s Conference was scheduled during the first two days of our vacation. This year this amazing event was being held in our city of Houston. We decided to write that into our vacation plans. We are so glad that we did. The speakers were powerful and effective. Their convictions translated into inspiration for all of us in the audience. It was easy to tell that they had pastoral experience and knew the struggles of the thousands of shepherds who had gathered in the Brown Convention Hall. Healing, encouragement and resolve were happening in this massive room. Worship set up the ministry of the Word. The choir, orchestra and worship staff of Houston’s First Baptist Church masterfully drew in the lives and variations in culture representing the largest denomination in the country. Music has a way of unmasking the soul and massaging it to receive the ministry of His Spirit. We even found cheerful friendly people around us. It was more than the cursory glance or courteous nod in other venues. Together we shared the scars, the hopes, the disappointments, the terrors, the loneliness and the dreams that come with our common calling. 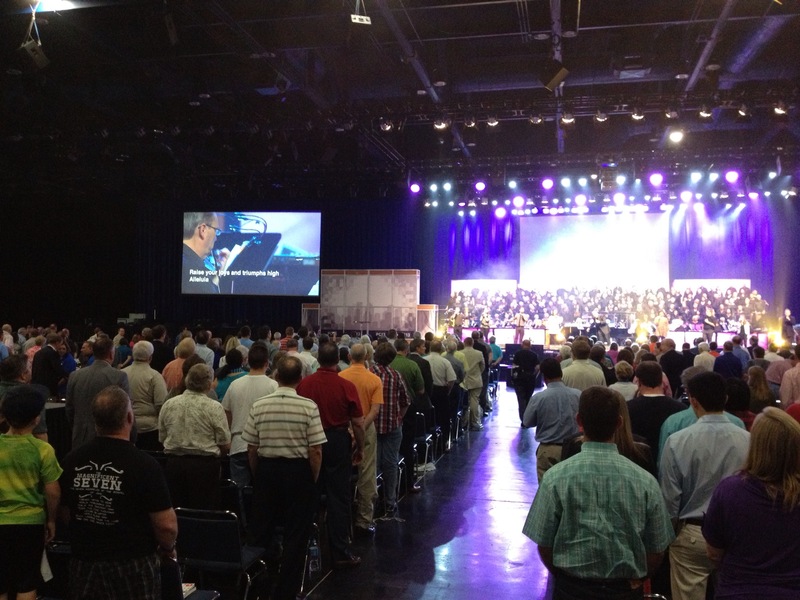 It is dubious at first whether worship can take place in a sterile cavernous place like a convention hall. There is little aesthetically that lends itself to seeing God in the middle of concrete, exposed HVAC ducting and electrical conduit. Yet, slowly, surely and spiritually the souls of many who have been set apart for a special service took over what the physical eye can see and allowed what the spirit alone can see dominate the gathering of special lives. This is a great way for us to start our vacation refreshment and revitalization. Amazing! We are grateful. There is one store that is not an outdoors specialization retailer that I enjoy visiting. It is national box store that has a nearby location. Their selection of products has an appeal to me. Whoever their buyers are, I have to tip my hat to them. They have many consistent regular products. But, they keep their options fresh with new and seasonal products. When those seasonal items are in, I pay attention. Also, they have coupon specials that advertise products as lower prices that surpass their normal daily good values. We do our coupon shopping there when we can. Over the years of experience, however, I have learned NOT to shop there on Saturdays or Sundays. It is too crowded. The holidays are horrendous as well, with the crush of crowds and huge basketful making long lines a common phenomenon. Since we pastors have Monday off, I like going there on that weekday. It has proven to be relaxing and free from the massive crowds trying to save by buying in bulk. We even stick around for a bargain lunch together. Something changed this past Monday, however. We were suspicious when we drove into the parking lot and had to search unusually hard for a parking spot. People were everywhere pushing carts full of goods, talking with friends and busily loading their cars with recent purchases. “This is weird to be so busy on a Monday,” I remarked. Once we located a spot and entered the store the crowds reflected the full parking lot. We dodged more than one cart so full of goods that the driver couldn’t see over the merchandise. “Is it Christmas time?” I mused with a smile. This was a big shopping day for us. Our list was long. The cart was full and I carefully negotiated the crowded aisles, not wanting to run anyone over. We did have a collision with one woman who was attached to a semi-run-away cart. She was so embarrassed. But, we had averted a great disaster by stopping her momentum. Don’t people work on Monday? This was in the middle of the morning. 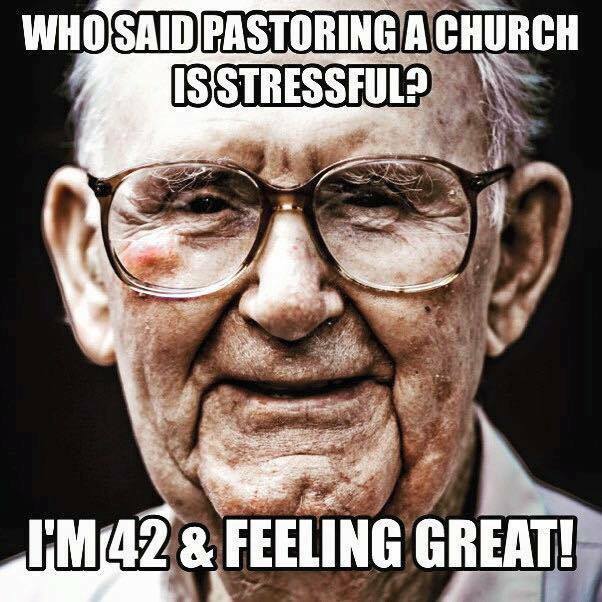 I guess they must all be pastors. No one in the ministry is careless about people. None of us ever want to be the cause of someone else’s stumbling. But, we don’t serve with paranoia. Stuff happens. It can even be brutal but we are not whiners, complainers nor do we react with nasty attacks. Instead, we who called to His ministry work hard, endure everything no matter how troublesome, difficult or stressful the work becomes. The word “brutal” was intentional. Sometimes ministry is that tough, either physically or psychologically. Some have been incarcerated for their faith. But, that could also be just as tough when we are severely limited in how we are allowed to function. Group antagonism, long hours of service, restless sleep and financial stress are common among those who are in His service. Ministry can also be just a delightful too. We enjoy the delight of purity, knowledge of circumstances, endurance and kindnesses shared with people. The Holy Spirit who indwells all believers makes His presence known in generous ways to we who are called to serve. The greatest symptom of God’s presence in our lives is also bountifully poured into our lives. That special expression of the Divine is LOVE. Those who called to serve live by the truth. When falsehood crowds our lives, He finds a way for the truth to make its way into our lives. He demonstrates His powerful presence in our lives; it is a blessing. We who serve the King of Kings have one primary weapons for our use: righteousness. It is effective when the ministry is going well or facing disaster, when we are surrounded by support or attacked with gossip, supported by those who cheer us on or undermined by those who are imposters of true faith. People are the focus of ministry and also its bane. Ministry can be very hard on the life of the one who is called and his family. As difficult as it can be, those who are recipients of effective ministry enjoy lives that God pours out His blessings. Even when lives under a righteous ministry suffer in this life, they know that God has given them all that they would ever want to have. Ministers are vulnerable in order to serve others effectively. There is no hesitation to be open to people. When those who are serve reciprocate with open hearts they will be blessed.